The Hearst name has been synonymous with newspapers in the public imagination for well over a century, but as the media landscape evolves, Hearst evolves with it. Within the 46 stories of Hearst Tower, a new crop of start-ups is growing through the company’s longstanding commitment to ventures. 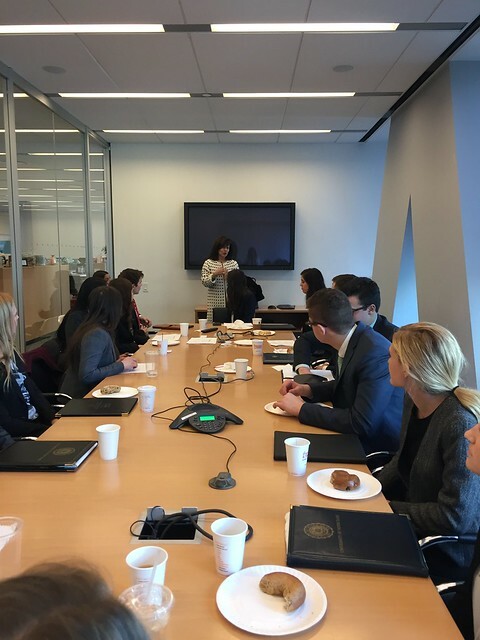 On Jan. 10, students were invited by Donna Lagani, Senior Vice President and Publishing Director, to visit Hearst and speak with individuals who play instrumental roles in the company’s venture capital spaces. During their visit, students heard presentations by leaders in two different sectors, HearstLab and Hearst Ventures. HearstLab, which was founded by Hearst’s own Eve Burton, serves as an incubator for women-led start-ups. In addition to providing small companies with the capital they need to grow, they also provide each company with office space in Hearst Tower. Situated in the heart of Manhattan for a minimum of one year, the start-ups and the women at their helms are equipped with the essential tools to help their businesses flourish. HearstLab Vice President Chris Wilkes spoke to students about the distinct advantages that elements such as prime real estate in Manhattan and reliable capital offers start-ups. It is not often that small start-up companies have the same tools as larger, more established companies across all sectors of the business. Access to high quality legal experts is a rarity among start-ups and can be indispensable as a start-up works to protect its product and its brand early in its life as a company. Sophomore Ann Paulose saw HearstLab as one of the most intriguing parts of Hearst’s business model and of the trip to Hearst as a whole. “It was exciting to recognize women's success in HearstLab and the company's hands-on approach in the start-ups they invest in,” she said. While Wilkes works directly with HearstLab and emphasized their mission to prepare women-led start-ups to prosper on their own, Hearst also has other divisions devoted to investing in the future. One such division is Hearst Ventures, from which students also had the chance to hear from representatives. Senior Managing Director/Head of International Investments Kenneth Bronfin and Managing Director/Vice President Darcy Frisch spoke to students about Hearst’s philosophy on investment and the processes through which they go about choosing companies and products in which to invest. Both Bronfin and Frishch emphasized the importance of a diverse portfolio and spoke about their passion for investing in the emerging technologies of the future. According to sophomore Chris Wilcox, Hearst Ventures’ commitment to investing in the technologies of the future impressed him, as he had previously thought of Hearst’s source of revenue as growing outdated. “It seemed that their revenue was coming from places such as newspapers, magazines, and cable channels. Therefore, I really liked when [Mr. Bronfin] talked about how important diversification was, as by doing so they are minimizing their risks in the future,” he said. Throughout the trip to Hearst, students were able to witness some of the cutting edge practices in investing and had the chance to experience investing outside of the Wall Street environment. “The trip as a whole was a great opportunity to see how some of the most successful professionals in the venture and start-up space think about the world and the ways in which it's changing today,” sophomore Dan Delfico said.